I set out to write a post about spring wreaths. But sometimes you have to follow your muse. Oh, there IS a wreath in the post. But when I got to the flower shop, the blooms led me down a different path. And pretty soon my wreath became a bit player in a pretty sumptuous Easter centerpiece. The good news is it’s a really easy centerpiece to duplicate, despite its imposing presence. In fact, it took minutes to put together. It’s also a money saver and the perfect DIY for someone not particularly adept at arranging flowers. Let me show you how. It all started with this boxwood wreath. I’m a pretty big fan of preserved boxwood, as it has a classic elegance. 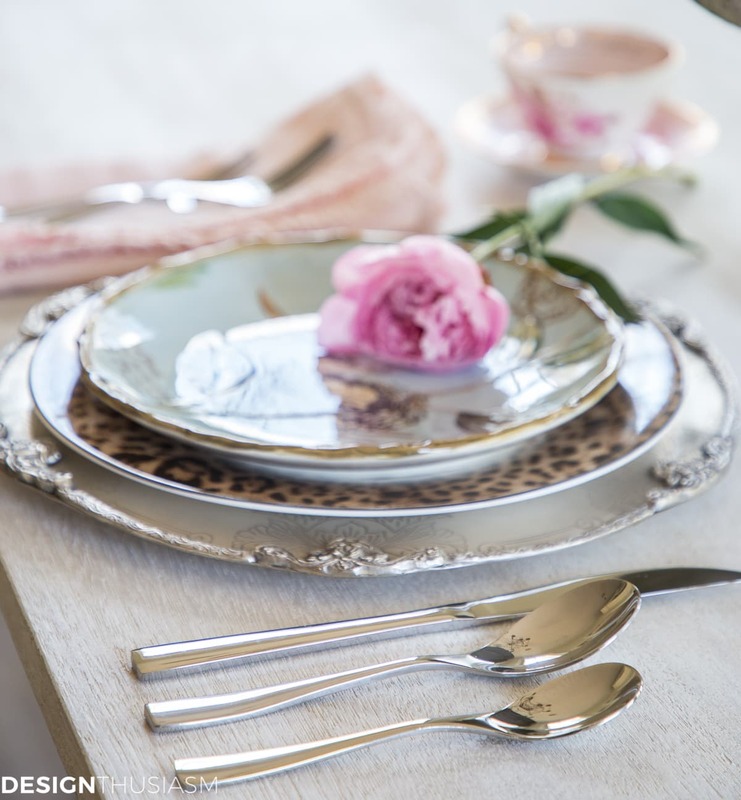 It can be used for any season and I love that while it’s not quite alive, it’s not faux either. For me it imparts a note of pedigree which I so appreciate. My plan was to decorate the wreath with spring flowers, and off I went to the flower market. To be fair, it was always my intention to show you a few uses for the wreath, so the one I wound up with was not entirely out of left field. But I didn’t expect it become the focus of today’s tutorial. Yet the flowers had other plans. The options that would be right for decorating my wreath were either tight little buds that would not be open any time soon, voluminous bouquets that were way more than I wanted to spend to cut up into little pieces or completely missing from the selection altogether. 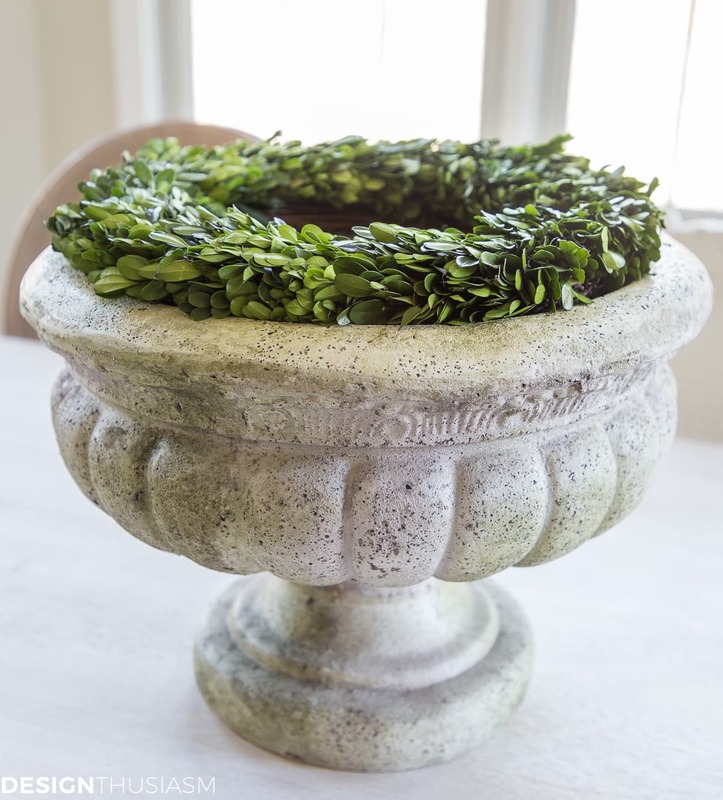 I picked up a few of the tight little buds for future use and moved on to plan B.
I wanted to use the wreath in a horizontal display, sitting atop a low wide planter. I have one that is perfectly sized so that my wreath can be tucked just inside the rim, sitting there like a collar. This creates a sort of hedge that can function as a lovely border around an upright display of stalky flowers. The challenge was to find flowers that would serve that purpose and could also fit inside a vessel that could be tucked into the planter. If they were the ideal expression of spring, all the better. A tall order for sure, I thought. 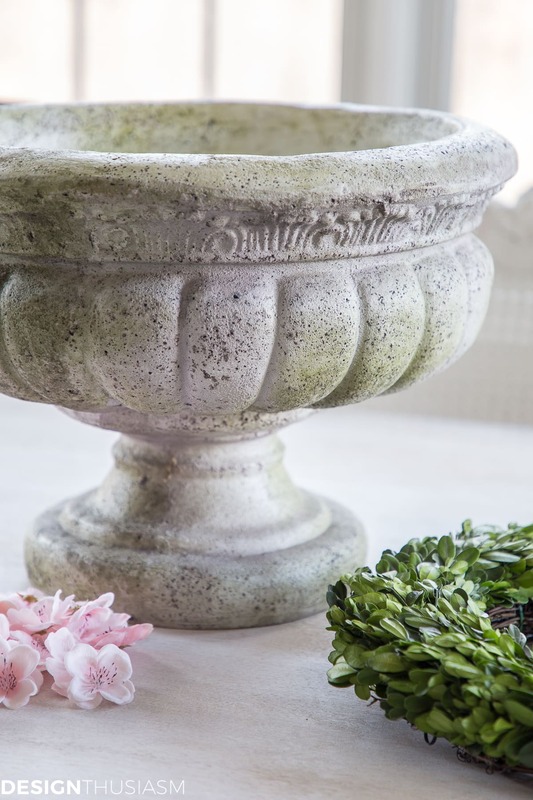 If I found something stately enough to achieve the visual look I was after, how would I get it to stand in a shallow holder that wouldn’t be seen above the rim of the planter? And since I was buying all those tight little buds for my next project, it would be nice to find something on the economical side. The answer to this dilemma was to find a flowering plant, a much cheaper option than cut flowers and one that lasts longer! And if it happened to include that heavenly scent that hyacinths possess, I knew I had found my spring muse. Are you like me? 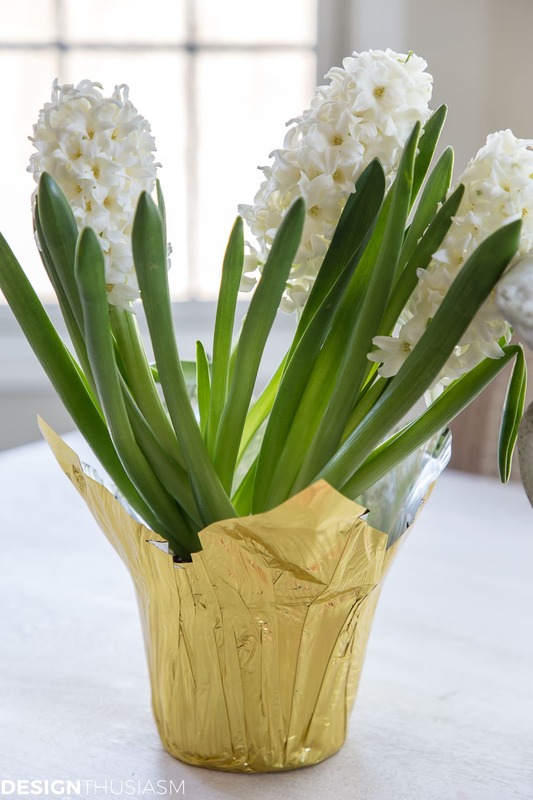 Do you put hyacinths in your shopping cart and then walk around the shop with your nose in the cart, delighted over and over by that amazing scent? On the ride home it fills the car and once I arrive home, I keep walking into the kitchen to get another dash of the scent wafting by. Best of all, and this is for the ‘flower-arrangement-challenged’ out there, I simply dropped the plant into the opening in the planter and voila! Instant centerpiece. You can tuck in bits of crinkle paper filler, to keep the plant steady in the planter. 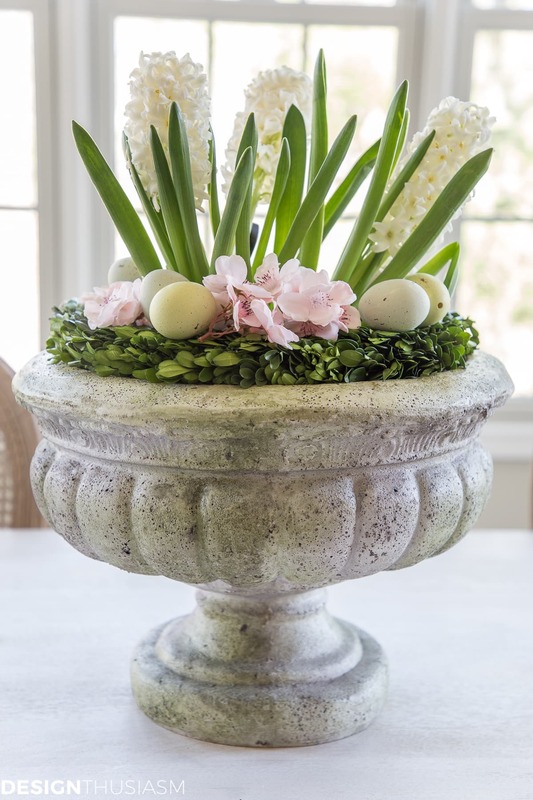 I could certainly have stopped there and enjoyed this simple spring arrangement, but with Easter coming, I wanted just a few more details. 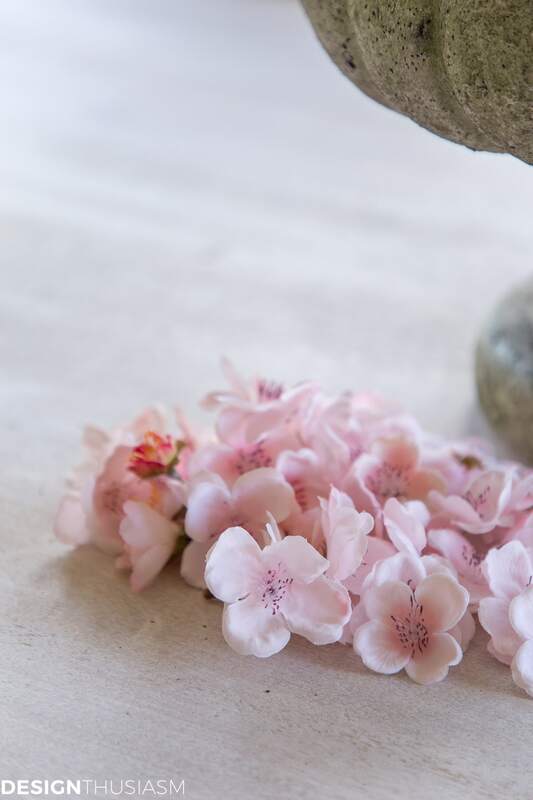 First I gathered the fallen flowers from my faux cherry blossoms which I had culled together in the bottom of a nearby bowl. 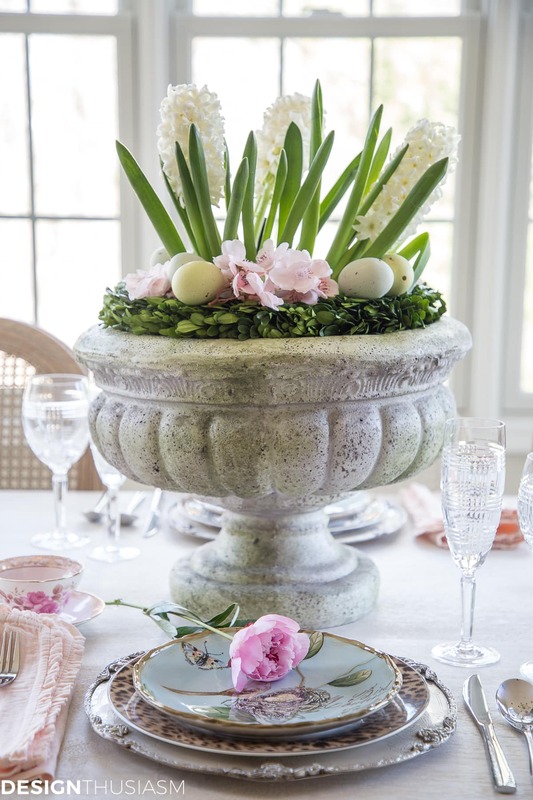 I’m pretty much in love with their soft pink color and I knew they’d add a pretty dimension to the Easter centerpiece. Next I tucked in a few speckled eggs for the final touch on this holiday presentation. This was seriously the easiest arrangement I could possibly pull together. 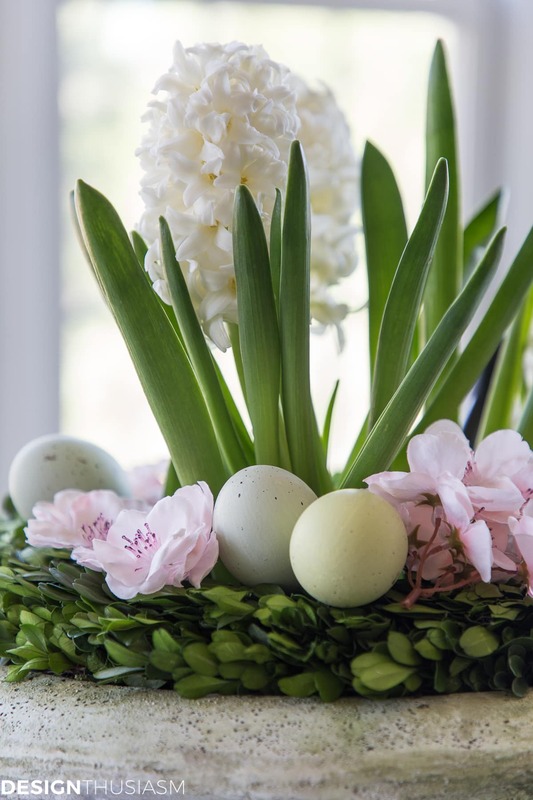 Place down the wreath, tuck in the plant and pop a few eggs and fallen blossoms on top! $6.99 for a hyacinth plant. Everything else I already owned. And even if I needed to buy one of the elements, I could use it over and over again. Yet at the same time, my Easter centerpiece includes fresh flowers that smell absolutely divine! Now if my peony buds ever open, you just may still see that spring floral wreath. I absolutely LOVE this! So easy and adorable! Great stuff, Lory! Oh, Lory, you really made this simple and easy for anyone to create! 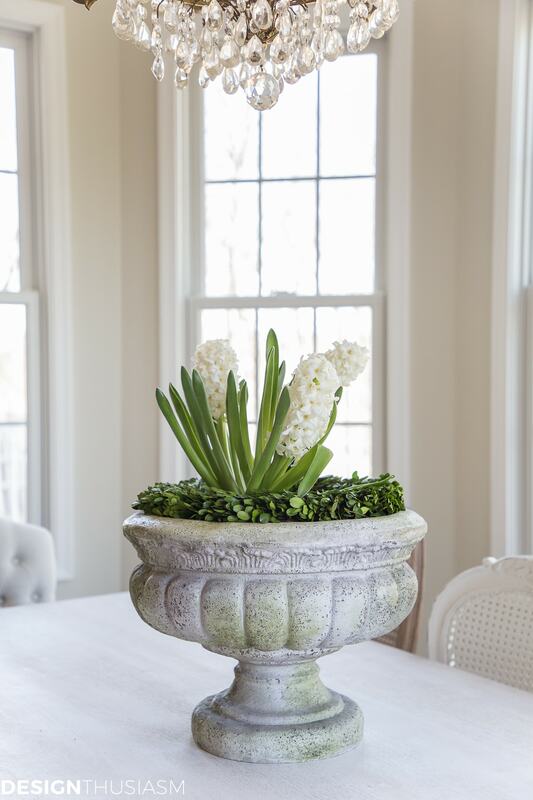 I feel like I can smell the fragrant hyacinth blossoms as I look at your pretty centerpiece. 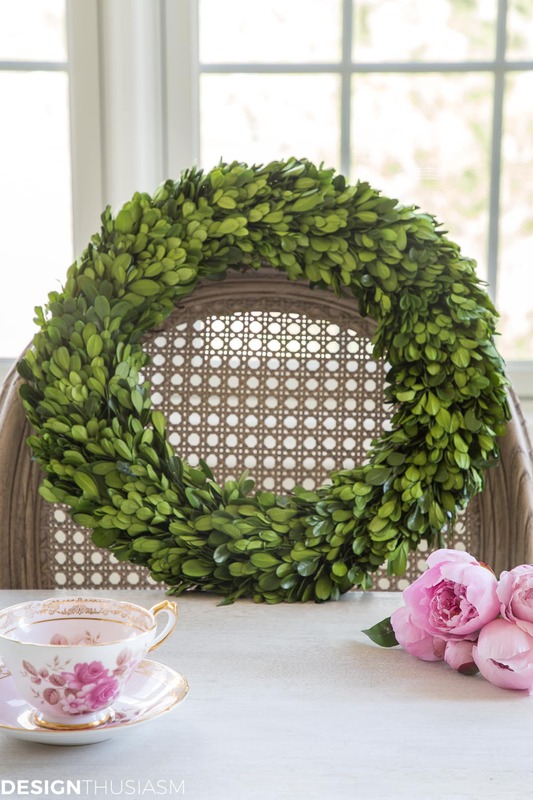 I am with you on the preserved boxwood wreaths, they are so adaptable to so many occasions and uses! Thanks Chloe! And yes, the smell is heavenly!! Really beautiful and easy to boot! A win-win project! Thanks for sharing!